Several Nikon D-SLRs will display histograms that represent a photograph's RGB (red, green, blue) tones. Nikon D-SLRs allow you to magnify a specific part of an image. When you do that, the histogram changes to represent only that section. Here a shadow area of the image has been magnified, and the histogram shows the arrangement of tones in that section. Note that the yellow rectangle in the small, complete image indicates the area of magnification. In this example a highlight area of the image had been magnified. The histogram is a graphic representation of the tonal range in a photograph, and its analysis of the image's tonal range provides a precise check on exposure. The histogram depicts the range of tones in an image from the darkest on the left of the graph (0 in digital terms) to the lightest on the right side (255 in digital terms). You might think of it this way: a light meter reads the scene before you take the photo; the histogram analyzes the photo you've just taken. 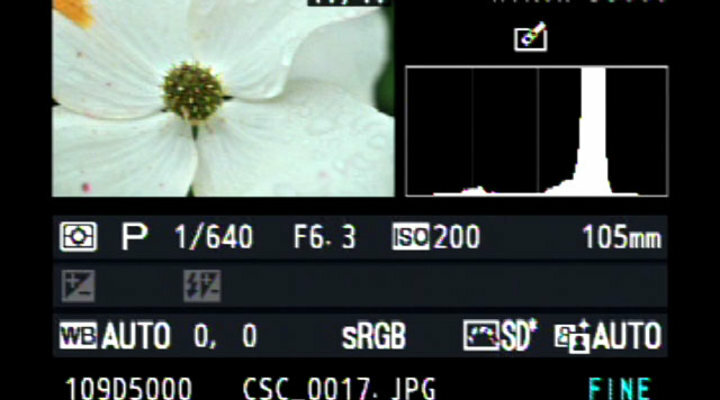 You can choose to have the histogram appear on the camera's LCD along with the playback display of your photo (see your Nikon camera's manual for the exact procedure). That's what the histogram is. But why is it an important, fundamental tool of digital photography? Simply because your understanding of the histogram will tell you if it's necessary to adjust your exposure, and it will indicate how to make that adjustment. The first thing to realize, though, is that it's not always necessary to use the histogram. In fact, selective use is best. Few if any photographers look at the histogram for each and every photo they take. In the majority of instances, your camera's meter will accurately and precisely set the correct exposure for the scene. But you should check the histogram when a scene's lighting is especially tricky; when there are areas of deep shadow and bright light in the same scene; and when you're going to take a series of images in the same setting and want to be sure your exposure is right on target. A glance at the histogram will tell you if parts of your photo are over- or underexposed. Overexposure means lack of detail in the highlights; underexposure, loss of detail in the shadows. The histogram will instantly reveal the situation: a heavy concentration at the left side of the graph means the image is underexposed and you've lost detail in the shadow areas; a heavy concentration at the right means your highlights may be blown out. The remedy? You can increase your shutter speed, close down aperture or lower your ISO to correct overexposure; the opposite settings will serve to correct an underexposure. Here's something you might want to use in connection with the histogram: the highlight overexposure warning. Set this option (again, see your manual for the specific activation method) and areas of overexposure will blink in the playback image. When you see these flashes of light—most people call them "blinkies"—you'll know exactly which areas of the image are overexposed. Several Nikon cameras feature secondary, color histograms. Choose to display them and you'll see three small graphs that show the intensity of the RGB (red, green and blue) color values in the scene. If you need to adjust these values, the camera's white balance control is the way to do it. Some cameras also allow you to magnify specific areas of the photo on playback so you can check exposure and detail rendering in very specific parts of the image. In effect, you're directing the histogram's area of analysis. The accompanying images provide examples of what we've been talking about, but the best way to see exactly how the histogram can help you take control of your photography is experimentation and experience. Just go out and take pictures in a number of situations and become familiar with what the histogram can tell you about the results. The histogram is a useful tool that analyzes tonal range and helps in creating a well-lit image.